The Heather Pierson Acoustic Trio burst onto the national folk scene in 2015 with their debut EP, “Still She Will Fly,” whose title track was the No. 2 single on the folk radio charts that same year,and three other songs were in 2015’s Top 100 folk singles. The trio’s full-length debut, “Singin’,” releases on June 30, 2017, the 10th release on Heather’s own record label, Vessel Recordings. It features Heather’s multi-genre songwriting, the trio's intricate instrumental arrangements, and stirring three-part vocal harmonies. “Singin’” is a document of 10 originals and two classics, spanning from the streets of New Orleans to the valleys of Appalachia. The group consists of award-winning singer-songwriter Heather Pierson (lead vocals, acoustic guitar, tenor banjo, piano); veteran performer, songwriter and engineer Davy Sturtevant (cornet, dobro, fiddle, mandolin, harmony vocals); and seasoned musician Shawn Nadeau (bass, harmony vocals). At the heart of The Whispering Tree are singer/songwriter Eleanor Kleiner and multi-instrumentalist Elie Brangbour. With their deep-reaching sound, haunting vocals and vivid lyrics, this Franco/American duo has been captivating audiences around the world since meeting at music school in London. Their eponymous debut EP and subsequent full-length album, “Go Call the Captain,” were heavily influenced by their travels abroad, which have taken them from their home base in New York to South America to a seven-month gig in Macau (China). “Go Call the Captain” was named "one of the year's most luminous albums" by The Big Takeover Magazine, and NYC's The Deli magazine called The Whispering Tree "one of the most talented duos to take stage in NYC." Their follow-up EP, “The Escape,” is a moody, introspective disc dealing with themes of freedom and captivity. Full of the imagery and storytelling that are the mark of The Whispering Tree’s sound, “The Escape” was described as “catchy, haunting, artsy rock” by New York Music Daily. 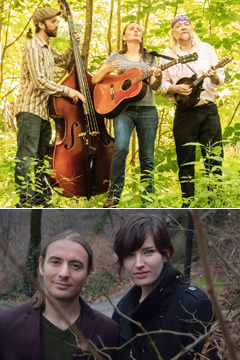 After relocating from New York City to Beacon, they were honored to lend their voices to Pete Seeger and Lorre Wyatt's album, “A More Perfect Union.” While working on material for their fourth release (due in early 2018) The Whispering Tree has released several singles re-imagining classic rock tunes as plaintive, harmony driven folk songs and have returned to Europe for tours in The Netherlands, Belgium, Germany and France.